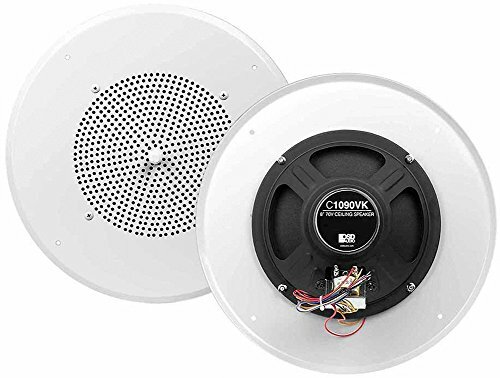 The C1090 8-Inch Ceiling 70V Speaker is made to produce powerful, rich sound or quiet background music depending on what you needs are. You'll love that it includes 5, 2.5, 1.25, 0.63, and 0.32 wattage taps via the front dial and rear indicator, making for easy setup with your other audio components. It also features 6-ounce magnets and 70V impedance. However, it's the dual 8-inch woofer cones that provide the incredible audio performance. These powerful features capture low, mid and high frequencies for rich, deep sound. And with simple volume controls, you can easily adjust your speaker as needed to best suit your commercial environment. Dimensions: 12" x 3-1/4"; Cutout: 10-3/4"